Picture a neighborhood store where health is the business model. Kids and busy families stop in—maybe even on foot or bicycle—for healthy snacks or staples for a quick meal. Junk food, tobacco, and alcohol are the exception rather than the rule, and they’re not marketed to young people. Check Out Healthy Retail inspires communities to transform this vision into reality. Corner stores, bodegas, and rural markets can be more than convenient places to shop—they can be healthy community assets. In fact, many retailers are making changes to improve their offerings and the store environment. 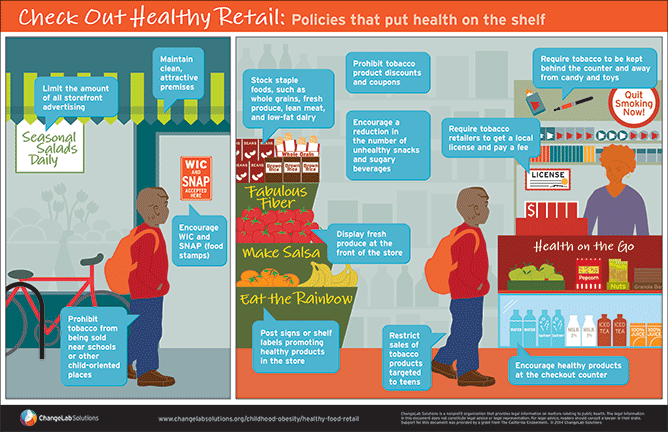 Policies that coordinate and streamline healthy retail priorities, such as providing and promoting healthy food options, limiting youth access to tobacco, and maintaining clean premises, can help nudge retailers toward a healthier bottom line. This infographic uses key elements of the retail environment, including advertising, displays, and inventory, to portray a store that promotes health at every turn. It brings together different policies that would simultaneously increase access to healthy food and beverages, regulate sales of tobacco products, and discourage the sale of unhealthy items. It is designed to educate stakeholders and advocates about healthy retail environments and help communities imagine how policy can support healthy retail. For more information on how communities can make neighborhood stores healthier, check out our toolkit on healthy small food retailer programs, Health on the Shelf, and our model ordinance and guide for licensing healthy food retailers, Licensing for Lettuce. For more information on Tobacco Retailer Licensing (TRL), check out our TRL resources. To learn more about building a healthy retail environment, see our complete library of healthy retail resources.